Another Front Seat Bouquet (Digital Print), a photo by randubnick on Flickr. 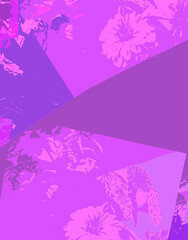 Last night I posted a piece of digital art that I made with Painter's pattern pen, using the pattern I made from my photo of a front seat bouquet. Actually, that image was my second try. I wasn't happy with the first try; although I liked the composition, I didn't like the color combination. Tonight, I was looking at that discarded image and realized that I just needed to change some of the colors with color overlays in Painter. So that is what I did, and here it is.